If you are considering having your carpets cleaned in the near future, have you thought about hiring a company that uses biodegradable cleaning agents? If you have, then OxiGreen in Morrisville, PA is a great choice for you! There are many really good reasons to choose a green carpet cleaning company such as OxiGreen. Our company uses 100% green cleaners in our carpet cleaning process. These cleaners are developed from the tea tree and are 100% biodegradable. They are completely safe for your carpeting and for the environment. There will be absolutely no toxic residue left in your carpeting and no negative impact on the environment. While these things are important, even more important is that green carpet cleaners contribute to a healthier indoor environment for your family! Chemical residue from so many products we buy and use in our homes impact the air quality for all the members of our families. Isn’t it nice to know that your freshly cleaned carpet will be just that: fresh and clean. Our professional technicians will provide your children and pets with a safe and healthy play environment, which is why we call ourselves a pet and baby safe carpet cleaning company! 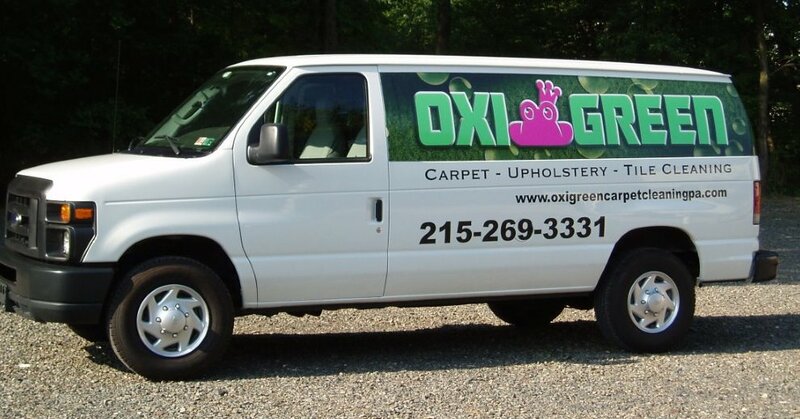 Feel free to call OxiGreen in Morrisville, PA today at 215-269-3331 to schedule your 100% green carpet cleaning. Our helpful customer service reps are ready to answer your questions and to tell you about our money saving package deals and our special anti-allergen carpet cleaning package. You can also learn about the other services we provide, such as expert carpet repair, carpet stretching, and grout and tile cleaning, online at http://oxigreencarpetcleaningpa.com . With years of experience, 100% green carpet cleaning, and our 100% satisfaction guarantee, you won’t go wrong with OxiGreen in Morrisville, PA!